A trust is an arrangement whereby a person (the settlor or trustor) transfers property to another person, a trustee, who manages the assets for the benefit of a third (the beneficiary), pursuant to the terms established by the settlor in the trust instrument. Living trusts in Oregon are governed by the Uniform Trust Code, codified at Chapter 130 of the Revised Statutes. When engaging in business with a trustee, parties to the transaction can request that the trustee provide a certification of trust. To allow the settlor to keep his estate plans private, the trust instrument is generally not recorded, and the trustee uses the certification of trust in the place of disclosing the entire contents of the trust instrument. The certification of trust, presented to anyone who is not a trust beneficiary, contains the essential information about the trust required for the pending or contemplated transaction, certifying its existence and the trustee's authority to do business as fiduciary. The statutory requirements for a certification of trust are located at ORS 130.860. The certificate must state that the trust exists (generally by citing the trust's name) and provide the date of the trust instrument, and, in addition, the date of any amendment made to the trust. It should also include the name of the trust's settlor and the name and address of each currently acting trustee, and may also contain the name of a successor trustee, if any, "and the circumstances under which any successor trustee or trustees will assume trust powers" (ORS 130.860(8)). The certificate also enumerates the trustee's powers relevant to the pending transaction. Some trustees may provide copies of excerpts from the trust instrument designating the trustee and establishing the requisite powers (130.860(6)). For trusts administered by multiple trustees, the certificate establishes whether trustees can act individually, or if a majority of, or all trustees are needed to exercise trustee powers. Further, the certificate indicates whether the trust is irrevocable or revocable, along with the name of any person who can revoke the trust. 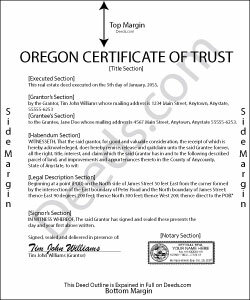 In Oregon, the certificate should also specify if the trust can be amended or modified, and by whom. Identifying information, such as the last four digits of the trust's taxpayer identification number, the jurisdiction under the laws of which the trust is governed, and the name by which the trust holds title to property, is also required. The certificate must also include a statement that the trust "has not been revoked, modified, or amended in any manner" to cause the within statements to be incorrect (130.860(4)). For transactions involving real property, the certificate should also include a legal description of the subject real property. Recipients may require that the certificate also contain other facts "that are reasonably related to the administration of the trust" (130.860(7)(a)). Certifications of trust in Oregon must be executed by all trustees (130.860(3)). Depending on the circumstances, the recipient of a certificate may require that the certificate be executed by a settlor or settlors and/or by a beneficiary or beneficiaries "if the certification is reasonably related to a pending or contemplated transaction with the person" (130.860(7)(b),(c)). Recipients of a certification of trust may rely on the statements contained within as fact without further inquiry (130.860(9)(a)). Transactions are not enforceable against the trust if a recipient has actual knowledge that a trustee is acting outside the scope of the trust (130.860(9)(c)). Those who fail to request or accept a certificate of trust under ORS 130.860 are still afforded the protections of persons dealing with trustees under ORS 130.855 (130.860(12)). Contact a lawyer for guidance about trusts, trustees, certifications of trust, and rights of persons dealing with trustees in Oregon. Laurie F. said: I am so glad I found Deeds.com. You had exactly what I needed and made it easy to download. I have bookmarked you in the event of further inquiry. Thank you. Ron S. said: Fair price and beneficiary deed was recorded without issue. Completion instructions provided were insufficient in some cases. Reply from Staff: Thank you for your feedback Jacinto. Charles R. said: No review provided. Reply from Staff: Thank you for your review. Have a fantastic day! Robert G. said: Very nice. Especially liked that I could re-use the form since I have a couple of properties.